New Jersey sent some of its best to Nike Cross Nationals on Saturday in Portland, Oregon. Entering the weekend CBA and North Hunterdon were coming off Northeast Regional victories and we had multiple strong representatives on the individual front as well. Our best performance of the day came in the girls race with Charlotte Bednar, a freshman from the Hun School of Princeton, who placed 12th overall running 17:29. 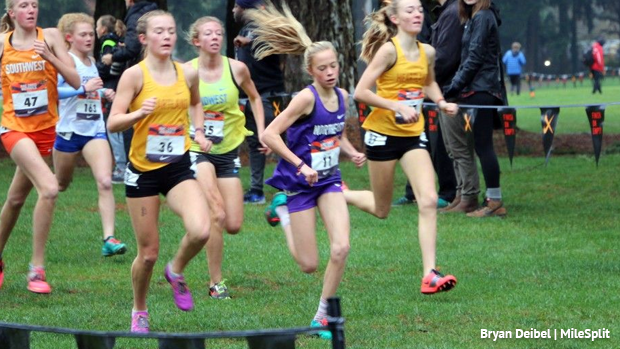 This was a season to remember for the young star who amassed four victories including three local championships, a fourth place finish at Nike Cross Regionals, and now second team All-American at NXN. She is New Jersey's first top twelve finisher in the girls race since Sarah DiSanza of High Point Regional came across 10th in 2012. Also in that race was Alexa Westley of Warren Hills who placed 33rd running 17:47. She had won the Northeast Regional, and finished third at the Meet of Champions the weeks leading up to this. The Meet of Champions and Northeast Regional winning North Hunterdon girls finished 16th as a team scoring 315 points and averaging 18:48. They were led by senior Emily Nugent in 46th at 18:02, Chloe Gonzalez 52nd at 18:06, Ellie DiMarcello 141st 19:13, Alexandra Carlson 145th 19:18, and Magdalyn Hoffman 146th 19:18. Their third straight Nationals appearance, this improved upon their 2017 performance when they finished 21st averaging 20:02. The boys side saw an All-American athlete as well. Mendham senior Jack Stanley, who is on an absolute roll as of late, finished 19th running 15:20 for third team All-American. Despite not competing at the Nike Cross Northeast Regional he was added to the field after receiving an individual at-large bid from NXN this past week. He won the Foot Locker Northeast Regional last Saturday which impressed the Nike Cross meet directors enough for the highly sought after invitation. After flying back from this race Stanley will be up in the air once again this coming weekend to compete at Foot Locker Nationals in San Diego, California on December 8th. John McGovern of Somerville closed out a great senior campaign with a 75th place finish running 15:58. McGovern was fourth at Northeast Regionals, seventh at the NJSIAA Meet of Champions and earned a county and conference championship this fall. On the team front Christian Brothers Academy finished 18th scoring 371 points, averaging 16:25, and splitting 43 seconds. They were led by Tim McInerney running 85th at 16:06. While this wasn't the outcome they had hoped for at NXN this team found plenty of success along the way to their ninth straight National meet appearance such as winning the Northeast Regional title and NJSIAA Meet of Champions in the weeks leading up to this. The rest of CBA's top five finished as follows: Shaw Powell 102nd 16:16, Luke Reid 114th 16:19, Troy Hill 140th 16:33, and Mike Morris 159th 16:49.